Summaries of the Nazar Group's research interests are listed below. Please click on the titles or the expand/shrink links of the individual projects to read the project descriptions. Next generation lithium batteries that do not rely on intercalation chemistry will afford us greatly increased energy densities than our present lithium-ion battery technology. The lithium-sulfur battery has the highest theoretical energy density of any solid cathode material and is both environmentally benign and low cost in comparison to metal based positive electrode materials. Li-S research in our group began in the late 2000’s with the introduction of a very promising positive electrode material that featured sulfur impregnated into a mesoporous carbon host – CMK-3. This preliminary research has led to the design of other carbon hosts for sulfur with larger mesopores, bi-modal mesopores and graphene enveloped sulfur particles. Containment of sulfur and its reduced species is highly important for long-term cycling and coulombic efficiency. Our research also focusses on porous additives that will aid in trapping reduced sulfur species in order to maintain active mass at the positive electrode. With the increasing importance of electrified transport, the need for high energy density storage is also increasing. Possible candidates include Li-O2 batteries, which are the subject of rapidly increasing focus worldwide despite being in their infancy of understanding. 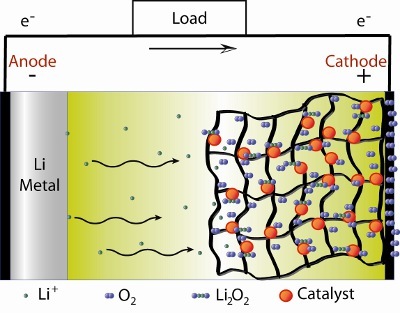 This excitement owes to the high energy density of Li-O2 (up to 2-3 kWh/kg), theoretically much higher compared to that of other rechargeable systems, and its open “semi-fuel” cell configuration that uses oxygen as the positive electrode material. To bring Li-O2 batteries closer to reality as viable energy storage devices, and to attain suitable power delivery, understanding of the underlying chemistry is essential. Understanding the fundamental principles that govern Li-O2 behaviour is our group's primary research objective. The main focus of our experiments are directed towards novel cathode materials and the influence these materials have on Li-O2 performance. Principle investigations involving Li-O2 electrolyte are also active research topics within our group. These areas are explored to better understand the chemical processes that govern Li-O2 performance, and to use this knowledge towards the development and optimization of novel Li-O2 materials. Layered lithium transition metal oxides arguably represent the most successful category of positive electrode materials, comprising compounds with formula of LiMO2 (M = Mn, Co, and Ni) that crystallize in layered structures. This topology offers highly accessible ion diffusion pathways. Today they are used in almost all personalized electronic items such as cellphones, laptops etc. However, concerns over safety and cost have prompted research into other new electrode materials for lithium ion batteries. Considerable interest in a new class of transition metal phosphate materials was sparked by the introduction of LiFePO4 as a cathode material. Since then, several new compounds have been explored as possible alternatives, including those obtained by introducing large polyanions of the form XO4y- (X = S, P, Si, As, Mo, W) into the lattice. An inductive effect from PO43- and SO42- ions raises redox energies compared to those in oxides and stabilizes the structure. Research shows that most lithium metal phosphate and sulfate compounds containing FeO6 octahedra as the redox center have potentials in the range of 2.8-3.5 V versus Li/Li+. Such low voltage reduces overall energy density of the system. Recently we have been able to develop cost effective and scalable synthesis methods for high voltage fluorosulfate based polyanion materials such as LiFeSO4F and LiFe1-xMnxSO4F. Specifically, LiFeSO4F crystalizing in a disordered triplite-type polymorph provides highest voltage ever reported for Fe2+/Fe3+ redox couple. These materials provide fascinating solid state chemistry and electrochemistry which have been success fully implemented in high energy density Li-ion cells. Scientific advancement is needed in the areas of higher voltage aqueous electrolyte research involving over-potential phenomenon to increase energy storage capacity and improve reversibility in supercapacitors. 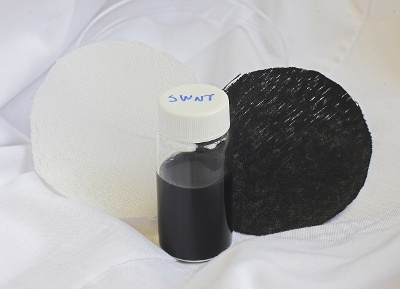 Special emphasis is placed on inexpensive, scalable and environmentally friendly processes and materials such as the use of aqueous pH-neutral electrolyte and carbon active material. Lithium-ion batteries are regarded as the battery of choice for powering future generations of hybrid and plug-in hybrid electric vehicles (HEVs and PHEVs). With the likelihood of enormous demands on available global lithium resources, concerns over lithium supply have arisen. With its abundant resources and low cost, along with its low redox potential (E° Na+/Na = −2.71 V vs. standard hydrogen electrode), rechargeable electrochemical cells based on sodium also hold promise for energy storage applications. Sodium-ion batteries operate on the same general principle as lithium-ion batteries: sodium ions shuttle through an electrolyte between a positive and a negative electrode while electrons flow through an external circuit. The electrodes typically contain a transition metal which can be reversibly oxidized and reduced. As with Li-ion batteries, positive electrode research for Na-ion batteries has been fervent in two categories of materials: layered oxides and polyanionic materials. Research in the Nazar group has focused primarily on the latter which led to the discovery of the novel iron phosphate Na2FePO4F, a high energy density positive electrode material for Na-ion batteries or for hybrid Na/Li-ion batteries. Other fascinating materials such as the olivines NaFePO4 and the solid-solution phase NaFe0.5Mn0.5PO4 provide promise for further developments in this field. Lithium-metal alloys, such as lithium-silicon, are one of the most promising materials to replace current carbon-based anodes. Silicon has a theoretical gravimetric capacity approximately 10 times greater than carbon (4200 mAh/g vs. 375 mAh/g), however silicon and similar alloy materials undergo a large volume expansion upon alloying with lithium over charge/discharge, which leads ultimately to cell failure. The focus of recent research has been on solutions to overcome the aforementioned problems associated with volume change in Si-based anodes, such as heterostructured nanotube arrays. These double-layered nanotubes of Ge and Si have been proven by Paik et al. 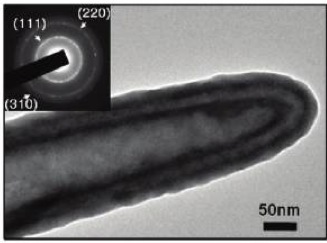 to display stable capacity retention due to reduced hoop strain in the nanotubes [Paik et al. ACS Nano, 6, 303-309 (2012)]. The application of nano porous carbons to rechargeable lithium batteries is one of the most popular subjects in recent years. In this lab, various carbons with different porous architectures and morphologies have been successfully developed. For example, ordered mesoporous carbon nanorods were prepared via a nano-casting process, by using mesoporus silica SBA-15 as a hard template. BMC-1, a bimodal mesoporous carbon, was prepared via evaporation induced self-assembly (EISA) approach with a soft template F127. The morphology of BMC-1 could be further tailored to obtain uniform mesoporous carbon nano spheres. All these carbons could be applied to Li-S batteries as frameworks of sulfur cathodes, in which the conductivity was significantly enhanced, as well as the discharge capacity and cycleability of the cells.